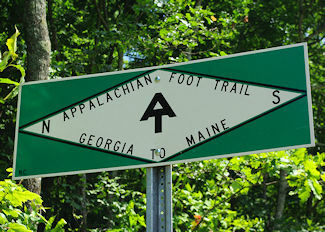 As you travel along the Appalachian Trail, you will encounter a wide variety of trail signs. Some are very formal, “national park-like” wood panels with carved recessed letters–others considerably less so, some as informal as a torn piece of paper in a zip-lock pinned to a tree. They all have a purpose, this kind of variety is one of the things I love about the Trail–it’s not all the same from state to state or even club to club. There’s a measure of individuality that can allow a club to express its own style. 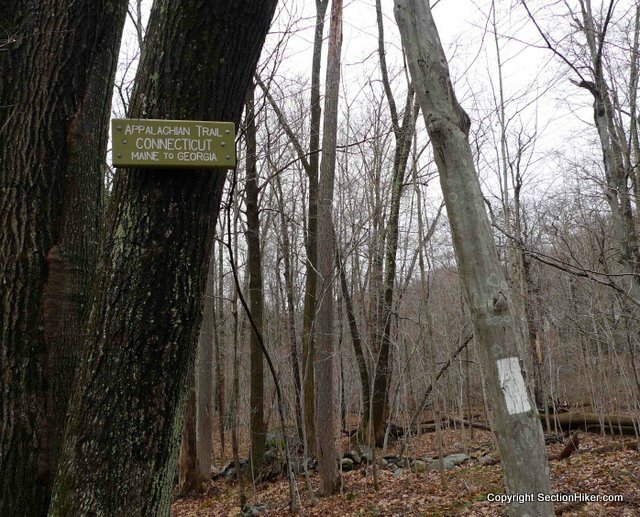 Did you know, for instance that in Connecticut the formal trail signs are light green with white lettering (there are even some in cursive script instead of block letters)? 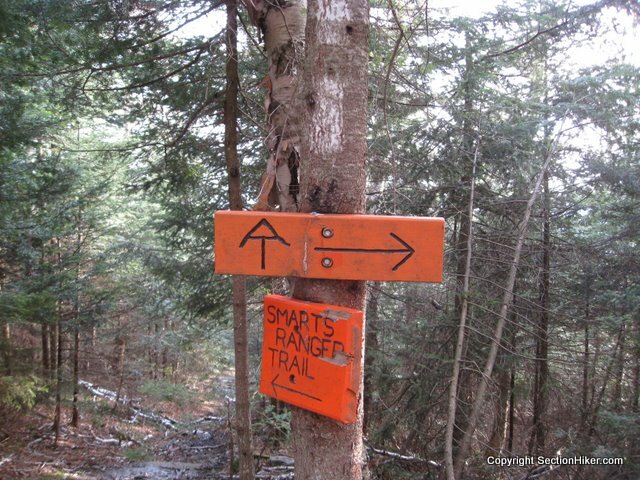 On trail maintained by the DOC (Dartmouth Outing Club) signs are orange with black lettering. 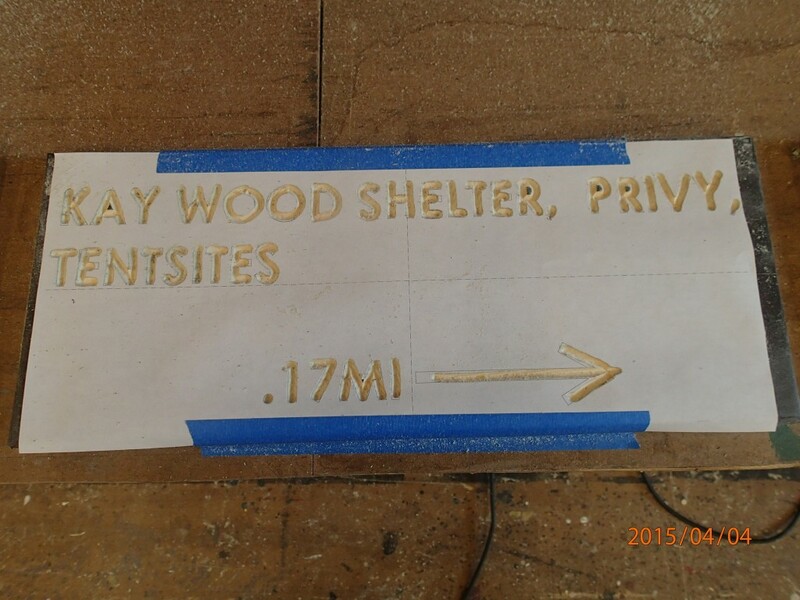 In Wilderness areas and some other jurisdictions, signs are unpainted, just the letters carved into the wood panel. If you’ve read other posts in this series, you’ll know what’s coming up next…yes, another variant of the Three Legged Stool where land-owning government agencies, ATC, and volunteer Trail Clubs work together to build, maintain and protect the A.T.
Blazes and signs will be kept to a minimum, consistent with prudent land management and hiker safety, to retain the primitive character of the Trail. Signs will be provided at shelters, designated campsites, trail junctions, trailhead kiosks and for direction to other areas that are not directly visible from the footpath. Permanent AT signs will be brown-stained with white routed letters. Signage will be kept to a minimum. These phrases are in reference to permanent signs, intended to stay on the trail for the duration of a sign’s lifespan, or until the information is outdated and needs to be changed (such as the addition or re-naming of a shelter or a change in the distances posted). Other signs of a temporary nature come and go as needed. These might be for a temporary reroute or “management activities” near by such as logging or a controlled burn. 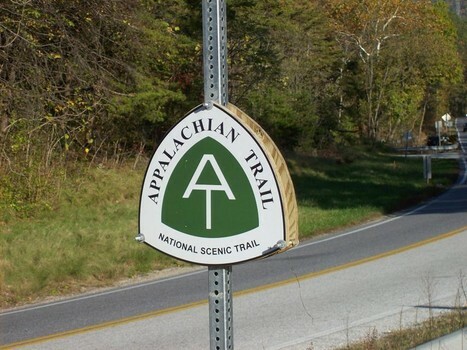 In part, it says: In order to maintain the natural character of the A.T. corridor, it is the policy of the Appalachian Trail Conservancy that advertising is incompatible with the Trail and should not take place within the A.T. corridor. 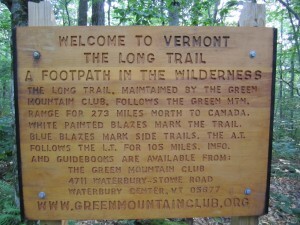 In this regard, most clubs instruct maintainers and other trail volunteers to remove and report any commercial signage encountered on the footpath. Recognizing that some information about services away from the trail is helpful, the best clubs then contact the advertiser, explain the policy and work with them to find a better way to communicate with hikers. 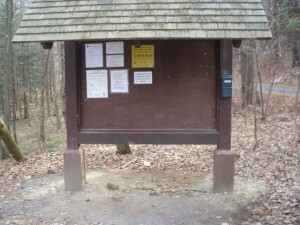 To this end, many clubs erect informational kiosks at trailhead parking areas and at places where the A.T. enters developed municipal areas (i.e. trail towns). While these kiosks tend to collect the usual variety of official postings regarding bears, ticks, fire, camping policies, etc, most also provide a place for local merchants to post menus, info about hostels, etc. Local schools may use kiosks to display student artwork or other projects related to the Trail. It’s a great way to get towns more connected with nearby sections of the A.T. In Mass, nearly every parking area kiosk has a full map of the AT in the state, complete with a “You Are Here” circle. I know of a person who section-hiked Mass using pics of this map on his cell phone. In Vermont, some kiosks have small sections of thumbtack-friendly material where hikers can post notes to each other (kind of quaint, in 20th century sort of way). All of this is in aid of providing info to hikers, be they on a 2100 mile quest, or out for an afternoon. What does a hiker really need to know? Not too long ago, a hiker would carry a map and likely (if she were hiking long distance) some sort of guide book. Today, in thru-hiking circles, maps seem pretty scarce–certainly ones on paper. Even day hikers are seen relying on their phones for trail info. As an official Old Fart, needless to say, I find this appalling. Is the pleasure of the big picture that only a map can provide fading from our collective experience? Perhaps you’ll find paper maps warehoused with the external frame packs and Limmers. On a slightly more serious note, losing (or not developing) the skill to know where you are in relation to the landscape is concerning to me–it seems like an essential part of being outdoors. And a good map will work in the rain, even with a dead battery. A map’s consistent scale, a reasonable contour detail and a hiker’s awareness of landmarks helps to know where you’ve been and where you’re going (or bail out). But I digress–I was talking about signs, right? Wait!–one more parting shot: Dan Feldman conducted a survey of 2014 thru’s; among others questions, he asked: Please select the tools you typically used to navigate while on the trail (check all that apply). This would seem to indicate that 80% of thru hikers don’t carry any map (other than what they would find in a guide book). This would indicate to me that signs play an important role in trail navigation. 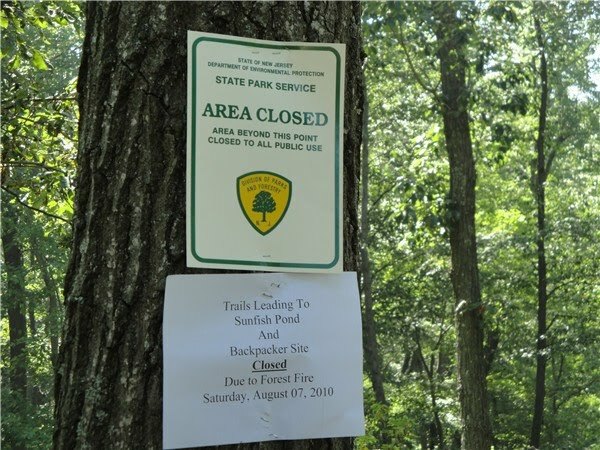 Signs are usually Informational (mileage, direction, location), Regulatory (permitted and non-permitted use and activity, boundary, safety), or Informal (notes to hikers, “there’s a wasp nest 100ft ahead”, “hiker feed tomorrow”, etc.). Regulatory signs are usually required by the land-owning agency, and are standardized throughout their area of jurisdiction. Many are often plastic, printed in bulk and intended to stand out visually. 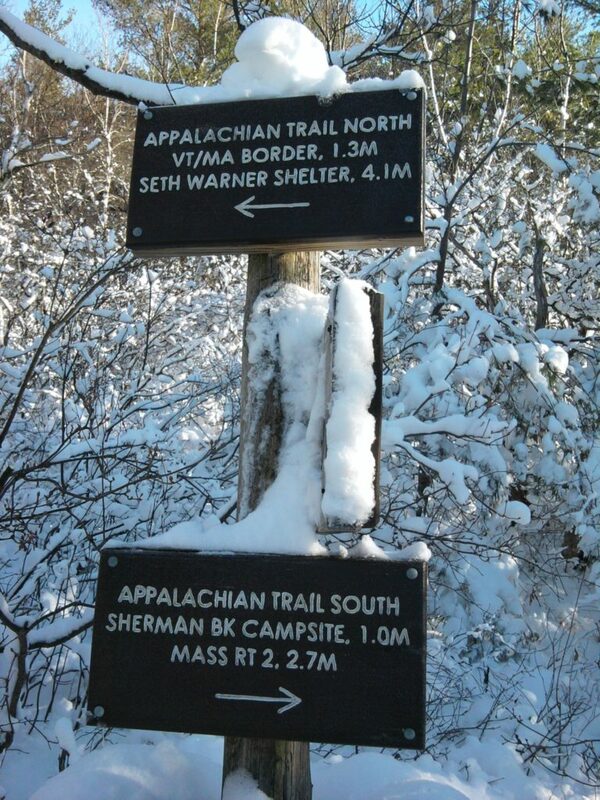 Informal signs are usually temporary, posted by hikers or other trail visitors. Similar to Regulatory signs, Informational signs are intended to be permanent, and generally provide info about where you are, and distances and direction to other key locations. They should be visible, but not prominent. Wood is the preferred material as it maintains a sense of coming from the landscape (as opposed to metal or plastic). At roads and some trailheads however, signs are often printed onto aluminum sheets like other road signs. For example, the A.T. “pregnant triangle” (the shape of which is used for ALL National Scenic Trails) is used in many states to mark where the A.T. crosses a road and is intended for vehicular “wayfinding”–that is getting to or finding the AT while you are in a car (‘tho we may occasionally use it as a trail sign for hikers). What to put on an Informational sign matters, as do the number or density of signs in a particular location. We try and find the balance between useful info and clutter. One way to manage this is to consider the likely visitor. At trailheads, and on popular areas visited by many day hikers, or a large network of trails crossing the A.T. , we might consider putting up more signs than in places that see fewer, and likely more experienced hikers. In Mass (again) for example, at Mt Greylock (a very accessible state park traversed by the A.T.) we have quite a number of signs on the Trail, many pointing to places unlikely to be of interest to a long distance hiker. You’ll find similar signage density in popular areas of the Whites. In Wilderness areas, there are fewer signs–the intent is to eliminate as many human-made artifacts as possible. With a few exceptions, content on all trail signs is basic. Directional arrows to the shelter/campsite, and Trail distances to a couple of prominent features north and south, such as the next road crossing or overnight site. Vandalism or theft can be a concern, especially near roads and parking areas. We also don’t typically list the distance to the closest shelter at a road, it can encourage inappropriate use. Signs near roads are often placed higher above the ground to discourage those that would do them harm. But if signs are too high, hikers don’t see them. 8-10 ft is pretty good in most cases. Making relatively small informational signs is fairly easy. 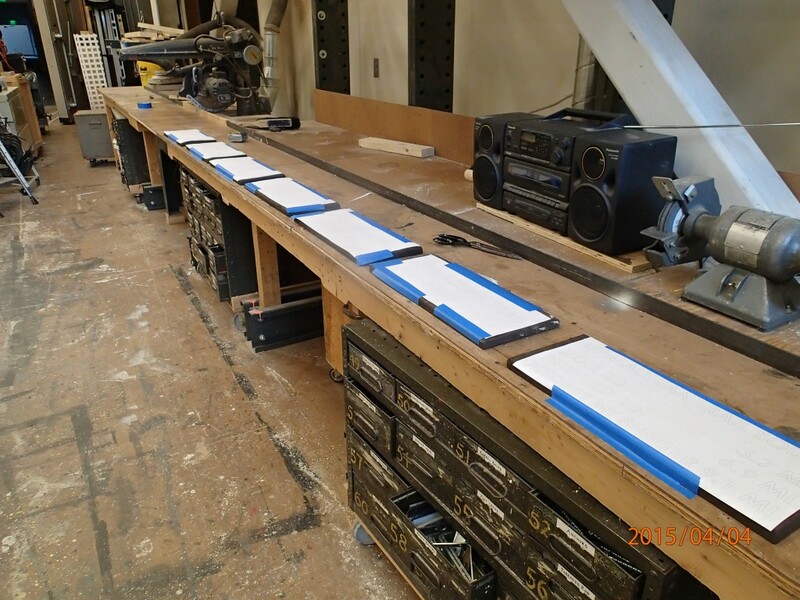 Letters are laid out on the blank board prior to cutting . Then a router (a power tool with a very fast cutting bit on the bottom, not the digital thingy that brings this article to your screen) is used to carve the letters into the board. Some makers use metal or plastic templates to guide the router–here’s a nice video from AMC about their sign shop. 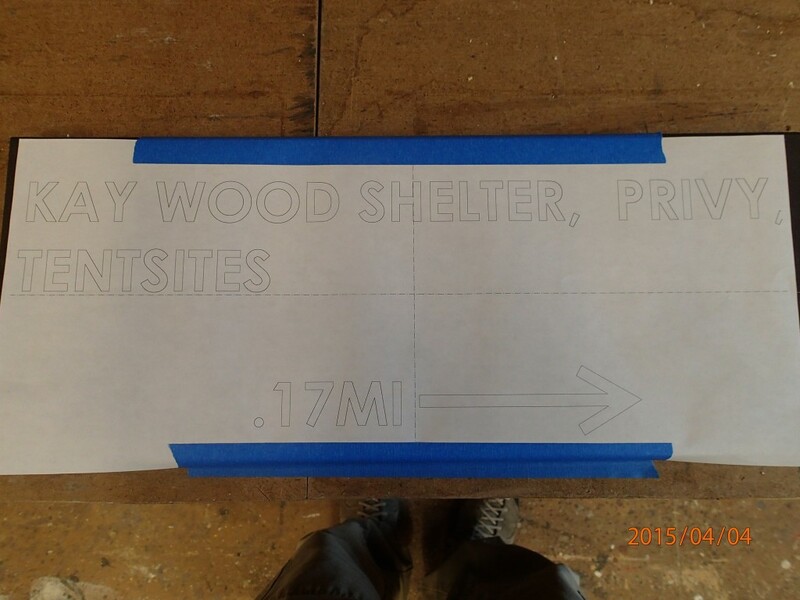 Other makers go freehand–here’s a sequence of my fabrication of this year’s crop of signs. 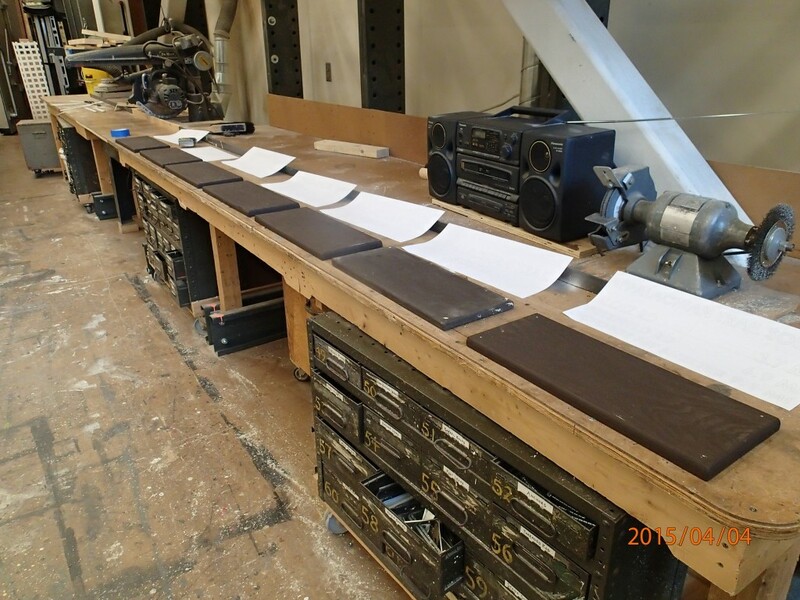 Routing completed, paper will be removed. 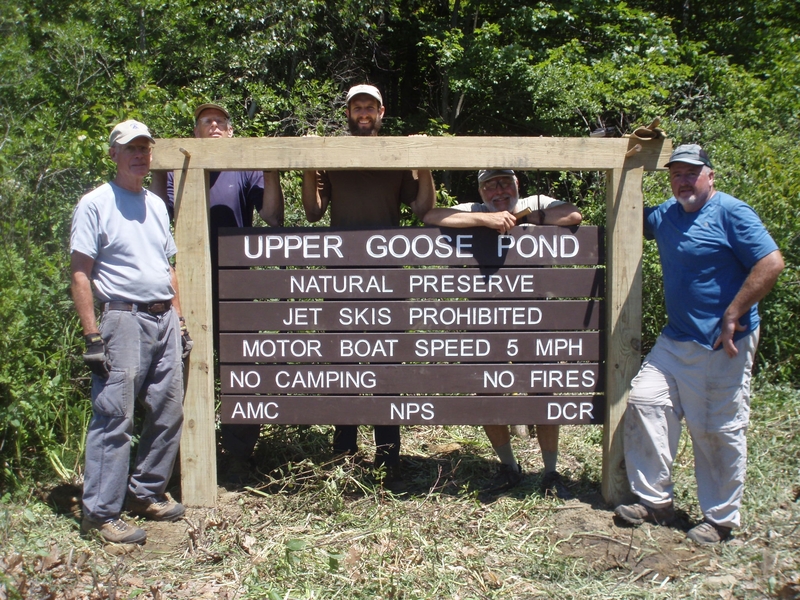 Large signs such as this one at Upper Goose Pond Cabin, can be routed by a computer controlled machine. In some places, that’s it. 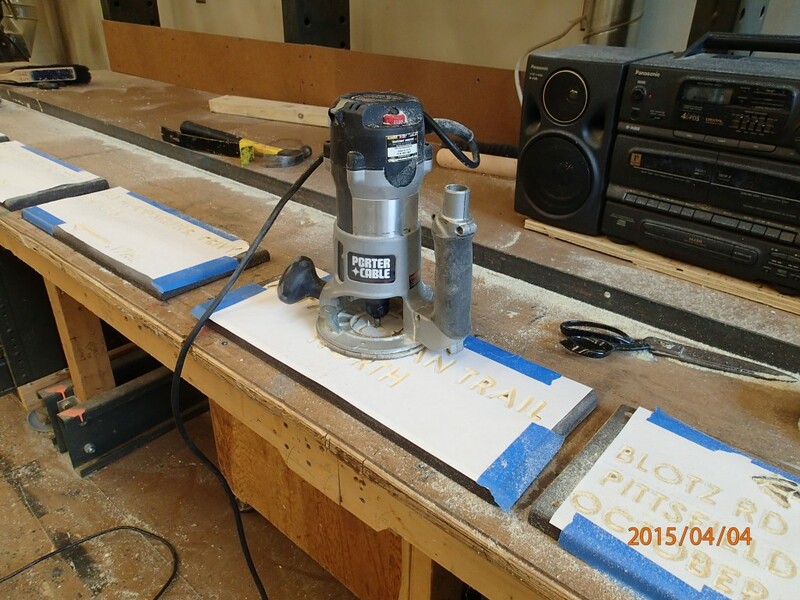 The routed wood panel is sanded smooth, and hung on a tree or post and left to weather naturally. It’s a nice look, but can be difficult to read on older signs, especially if they are high off the ground. Hardwoods such as oak, cedar, or locust are often used due to their good weather resistance. 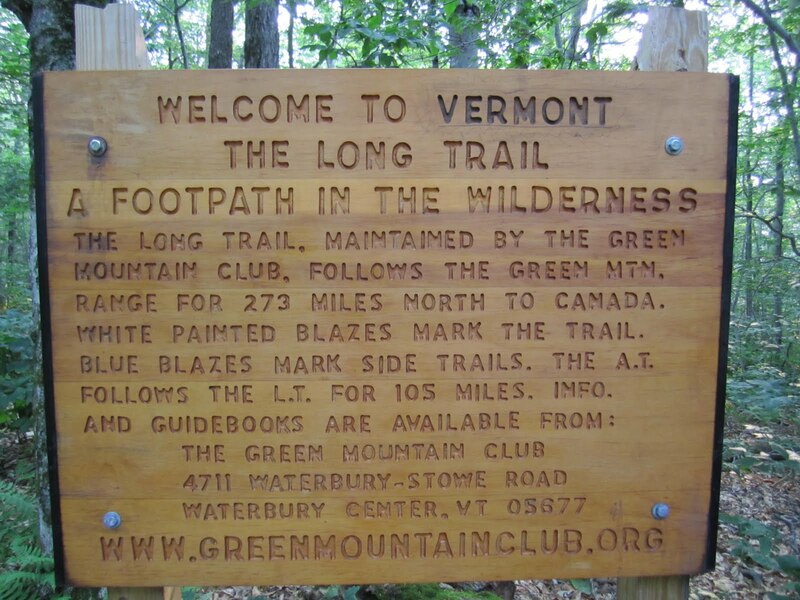 On much of the Trail, however, routed signs go through a painting process where the letters and face are painted in contrasting colors, and as noted above this can vary club to club. The painting of the sign is where the labor comes. It takes quite a while to paint in every letter carefully so they stay crisp in contrast to the face of the board. At least two coats of paint are needed. While prepping and cutting each sign takes about 30 mins, the painting can take several hours. Signs are a large investment in a club’s time, how long do they last? This depends mostly on the location. 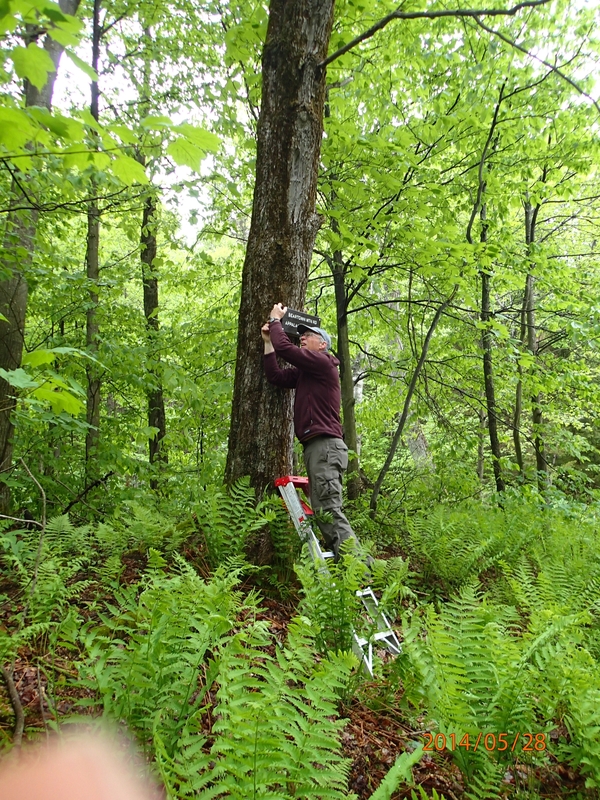 Hung on a healthy tree in the woods, out of direct sunlight, they can easily last 15-20 years–you may have seen signs where the tree trunk has actually grown around the sign board. 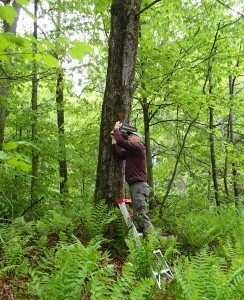 As trees grow, the trunk expands in diameter, but only gets taller at the top. The sign stays the same height off the ground, but slowly becomes embedded in the tree. While cooperation between a club and the land-owning agency(s) it works with is always important, signage can be a point where heads bump a bit. Clubs do want to express a measure of individuality, while government agencies seem to thrive on standardization. Sometimes it takes a bit of thrashing around to come up with a policy that allows for both. The goal is to provide accurate information that is easy to read, but not obtrusive in the landscape. As a hiker, you’ll see all sorts of signs made by all sorts of people. Despite a variety of policies, the A.T. has accumulated a fairly diverse collection collection of signage, enjoy the 31 flavors. While I found the article informative, I was surprised that little was mentioned about the type of blazes one might encounter and the information to be derived from them. Blazes are also a type of sign. Also, it could be confusing when looking at a sign that has a small “N” at the Georgia side of the sign and an “S” on the side of the sign that says Maine. I think it would be a more effective sign if the S were on the same side as Georgia and the N on the same side as Maine.